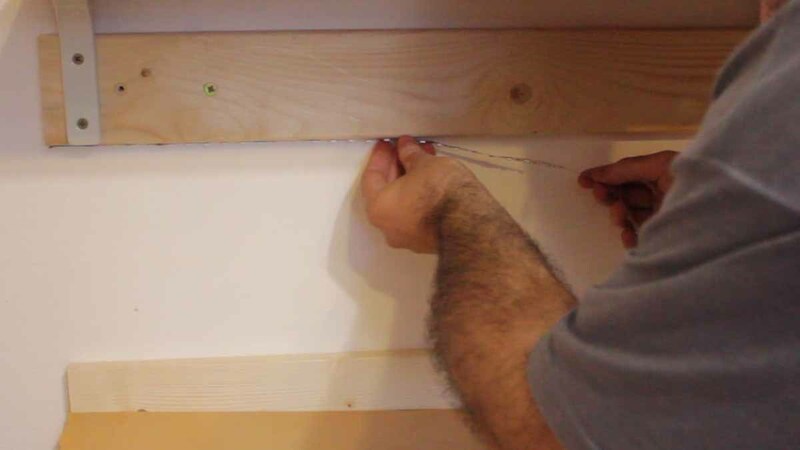 In Part 1 of How to build a DIY Electronics Workbench, I built the structure of the whole bench. 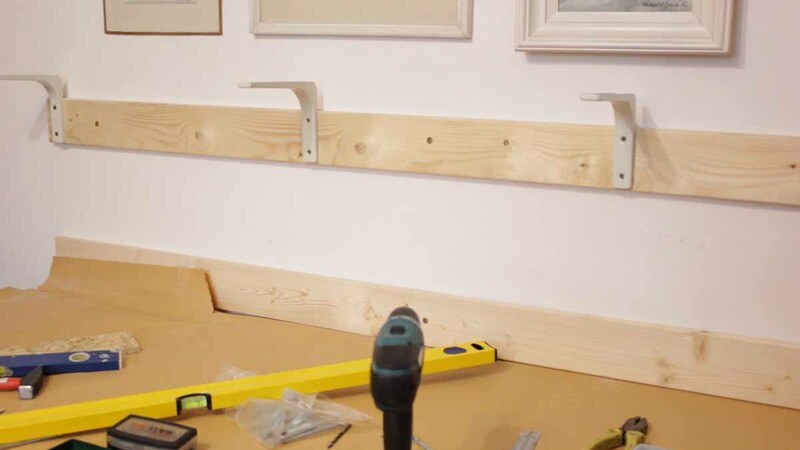 In this Part 2, I assemble and screw in some shelving, as well as hook up the electricity and install some LED Light Strips. I set up my resistors cabinet temporarily to act as a guide for the top shelf. To an identical piece of wood plank, I screwed in an L bracket to hold the top shelving. This wood plank was screwed to the wall like the first piece of wood. With the plank screwed to the wall, I attached the following L brackets once they were leveled. I used some left over pieces of melamine for the shelves. These were screwed in from the bottom so that they wouldn’t move around. I then started working on the wiring. Rather than an extension surge protector, I’m using this 6 outlet power module. I temporarily wire it in and screw it to the lower wood plank. I then continue the wiring by attaching a power cord and plug to my power module. I decided to also wire in a single circuit breaker using this one module box. This was test fitted to my power outlet. Because I want to be able to control the power outlet and the lighting separately, I decided to use a double switch for this. I measured its size and cut out an area in the module box so that it would fit besides the circuit breaker. I then soldered some of the leads to the double switch. With the switch installed in the breaker module, I started to wire in the breaker and test fit the entire setup. This took quite some fiddling around until I was satisfied everything fit in well. It was then time to attach the breaker module, LED power supply and RGB controller to the lower wood plank. With it wired in, I tested to see that both the White LEDs and the RGB LEDs worked. With the lighting complete, I could finally wire in the 6 outlet power module. This was screwed into its final position. I then tested that both Live and Neutral did not short and that the switch and breaker worked. That Ground wire is intended to stick out and will be connected to something in Part 3 of this build. 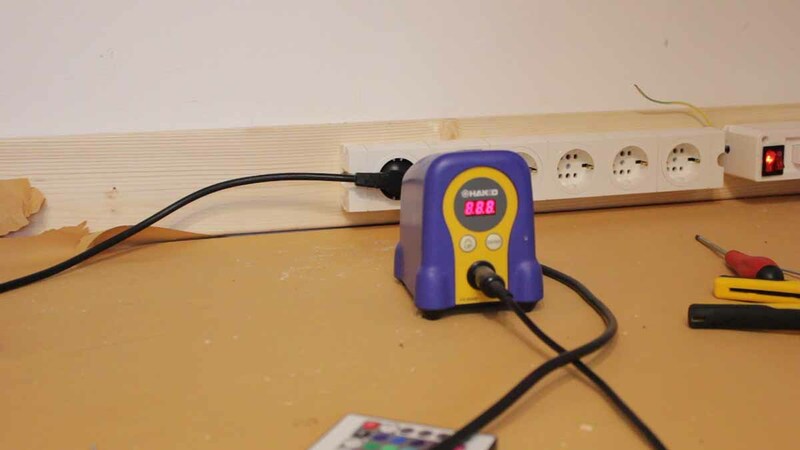 And then I connected my soldering iron to the outlet to test it out. You can see how one switch operates the power outlet and the other switch the lighting. And the circuit breaker powers off the whole setup. 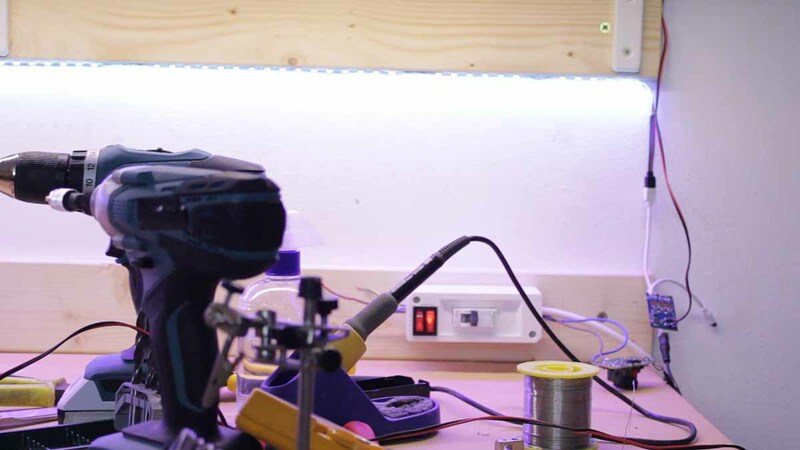 In the final part of this series, part 3, I setup the workbench with all of my tools and electronics. © Copyright 2015 Made2Hack / MadeToHack.